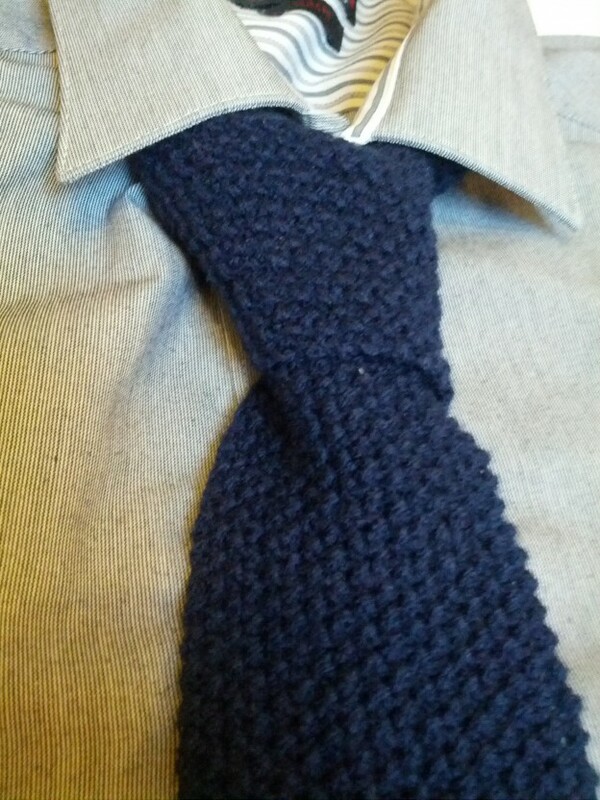 My brother asked me to knit him a tie. He chose the yarn (a cheap acrylic) and described how he hoped it would turn out. 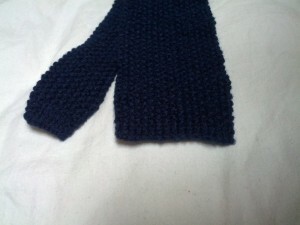 I had previously knit him a wool tie in stockinette stitch that curled terribly, and he wanted one that wouldn’t curl. I assured him that moss stitch was the way to go and started knitting. A few inches in, he told me he wanted a “flat bit” at the end. He wanted a few rows of stockinette to make a neater edge. He could have told me that at the beginning. The pattern creates a straight tie with square ends, and decreases that will be hidden under the collar when the tie is worn. Knit 6 rows in stockinette (knit a row, purl a row). Switch to moss stitch (*k1, p1* repeat to the final stitch, k1) and continue until work measures 80cm or 31″ ending on a wrong side row. Work across to the centre three stitches in pattern, knit or purl three stitches together, work remaining stitches in pattern. Whether you knit or purl the decrease depends on the previous stitch. If you just knit, purl the decrease. If you just purled, knit the decrease. This preserves the moss stitch pattern. Continue another 2.5cm or 1″, decrease as before. Repeat until 9 stitches remain. Continue working in moss stitch until work measures 140cm or 55″. Work 4 rows stockinette, cast off, weave in ends. I took your instructions on making a pointed end starting with co 3 and increasing each beginning and end stitch. It starts off well until I no longer wish to increase the width and carry on but when I do it always creates the ribbed stitch…what am I doing wrong? If you’re getting rib instead of moss stitch, it’s because of the stitch you’re starting each row with. If you’re starting each row with a knit stitch and getting rib, you need to start every alternate row with a purl stitch instead. Hope this helps. Help! I am knitting the first 6 rows ( as in K, P, K, P) …. it is curling. What am I doing wrong? perfect thankyou! got there in the end! starting again now!!!! wish me luck !! Oh good, glad I could help. You can do it! yes just one more question!! i’m still not 100% clear on the moss stitch! i’m reading so many alternating methods. can you write me out sort of the first 4 rows? like how you have done for the first row? So that every knit stitch has a knit below it and every purl stitch has a purl below it. If you were to alternate the knits and purls you would end up with rib instead of moss stitch. thanks for your quick reply! i was excited to check back after i finished uni! thats perfect thanks!! i did find it odd that all the patterns i have read for ties only stated what you have yet the tutorials online where saying something completely different!!!! i will definitely follow your pattern for the first try!! its a bright pink tie 😉 and i would love to show you the finished piece when its done!!! ill be sure to send you a photo!! how long does it take you to knit the tie do you think? love this pattern! it is the neatest ive found so far. then repeat 1 to 4.
is that what you are saying in this or are you saying to continually start with a knit for every row? i hope that makes some sense!! also, do you think the yarn material used matters for this? i have found a beautiful womens institute silky yarn that states 3.25mm needles – what do you think? its a little shiny and the colours are so beautiful! The stitch pattern you mention is a variation on moss stitch known as double moss stitch that produces a slightly different effect. You could knit the tie in either, although the decreases may need adjusting for double moss stitch so they don’t look odd. You could knit the tie in any yarn with any sized needles, but you may want to adjust the number of stitches so you end up with a reasonable width for the finished item. I would recommend using a smaller needle than the yarn calls for, this makes a neater, tighter fabric which is ideal for a tie. Thanks for this excellent pattern. Going to ask my 90 year old Granny who is still a whizz at knitting to rattle me a tie off. I’m almost the decrease in this pattern, but I seem to be stuck on one part. I was hoping you could clarify. Do you mean knit the first decrease row and then knit 1″ as normal in the moss stitch? Or do you mean continue knitting in the decrease pattern until you’ve reached 1″? You should continue as normal in moss stitch for 1″ before the next decrease row. 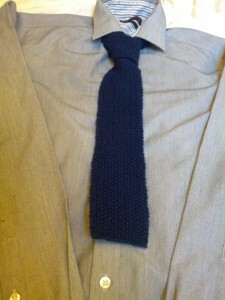 This makes the transition from the wider to the narrower part of the tie more gradual. Can you tell me the width measurement of your tie please? Have started knitting, but it looks too wide. I don’t have the exact measurements to hand but I think it was around 2 inches/5cm. If yours is too wide, either switch to a narrower yarn or reduce the number of stitches by a multiple of two to get the width you prefer. Could you clarify what these steps are? When you get to the decrease rows, you will continue knitting in moss stitch until you get to the centre three stitches, this is where you will place the decrease. Whether it is a purl or knit decrease will depend on which row you are on. After the decrease, you will finish the row in moss stitch. If the stitch before the decrease was a knit stitch, decrease by purling the centre three stitches together. If the stitch before the decrease was a purl stitch, decrease by knitting the centre three stitches together. You should be inserting the needle through all three stitches at once, and knitting or purling as if they are one single stitch. I hope this is a little clearer! Just started to knit the tie but I used a dk cotton and knitted every row.. ruffled it all down and used dk acrylic wool and the moss stich you said to do.. Just done 2inches but it looks great, I am knitting it for my grandson who will be 17 in August. Hi, my boyfriend wants a knitted tie for Christmas and I very much like how this looks but ideally he’d want it to start and end with a point, how would I do that as I am very new to knitting. I would recommend casting on 3 stitches to start, then increase at each end of the row by knitting or purling into the front and back of the first and last stitch, until you reach the desired width. The abbreviation for these stitches is KFB and PFB. You should be able to find a video tutorial on Youtube. Hope this helps!